The Steigerwald can be reached quickly by train. Trains of the Deutsche Bahn (RB/ RE) are connecting Würzburg and Nuremberg and run on a regular basis. Simply get off the train station Uffenheim, from here take the Bus 832 to "Hedwigsruh, Uffenheim" and change the Bus Line 142 to "Scheinfeld Post". The Steigerwald natural park can be reached quickly by car, the motorway A3 which connects Würzburg with Nuremberg, leads straight through the Steigerwald. The train station Uffenheim is the starting point from here take the Bus 832 to "Hedwigsruh, Uffenheim" and change the Bus Line 142 to "Scheinfeld Post". 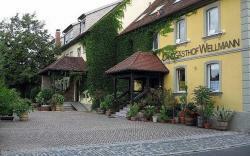 Explore a region full of Franconian charm, breathtaking natural wonders and picturesque castles. The Steigerwald Panoramaweg (panoramic trail) is well known as Germany's second most beautiful hiking trail. The Natural Park Steigerwald is situated in the middle of Franconia, half-way between the well-known historic cities of Würzburg and Nuremberg, between Rothenburg ob der Tauber and Bamberg. Besides those wonderful historic cities there great variety of things to explore and visit in the Steigerwald and its surroundings. Hiking in the Steigerwald Nature Park is a very unique experience. Every one who is approaching the nature park from the fertile and sparsely Franconian wine district in the West, already recognizes from afar a ridge which rises up to 220 m from the foreland - the "Steigerwald Panoramaweg" (forest panorama trail). The "Panoramaweg" hiking trail in the heart of Franconia runs over 160 km from Bamberg to Bad Windsheim. The trail offers many vantage points with new remote views, as well as lonely forests and many, rare and protected floral along the way. Forests, repeatedly interrupted by beautiful prospects in small valleys or in the vast foothills of the Steigerwald invite you and let the hikers heart beat faster. Picturesque villages, castles and castle ruins crown the mountains, such as the Stollburg ruin or the Zabelstein ruin. Probably, even the by historians long-sought birthplace of the minnesinger Walther von der Vogelweide is on the way. The hiking route goes through idyllic wine villages, which will enhance the hiking experience probably even more. Target is the to the world heritage Bamberg with its splendid buildings from the middle ages. The Steigerwald Panoramaweg was named to Germany's second most beautiful hiking trail. So the created according to guidelines for quality two-way "Walkable Germany" and consistently marked way offers everything a traveler wants. Before heading out, seek for local advice - Tourismusverband Steigerwald, Naturpark Steigerwald, Hauptstrasse 1, 91443 Scheinfeld or www.steigerwald-panoramaweg.de . - the office will help to find a route to match your fitness and time frame and can supply you with maps and further instructions. The City of Bamberg is only an hour car ride away.It´s a very historical city with a thousand years of art that has remained young. You can explore this city by shopping through a historical ambience & enjoy Bamberg in winter getting full of magic. The City is full of sights which are mixed by medieval charm & Baroque architecture. 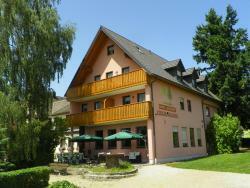 Enjoy peace and quiet in this cosy country hotel, situated in the rural village of Oberrimbach, 5 kilometres from Burghaslach, in the heart of the Steigerwald Nature Park. 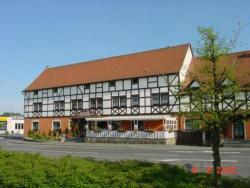 Situated in the Franconian town of Scheinfeld, in the Steigerwald nature park, this half-timbered hotel restaurant offers a traditional ambience, tasty cuisine and free Wi-Fi internet access. This family-run guest house offers free parking and a restaurant with beer garden. It is located in the Steigerwald Forest Nature Park, just 10 minutes from the A3 motorway.